If you really need to shine, this Royal Prestige brand metallic gold long sleeve shirt is perfect for the job at hand. Featuring a modern fit that is meant to be worn not tucked in and made of shimmering gold tone fabric. 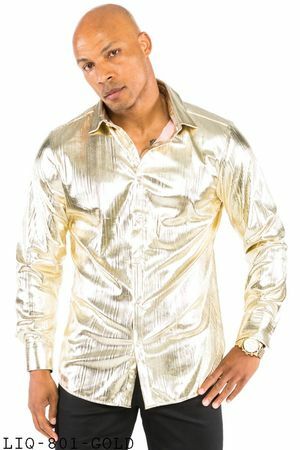 This metallic gold long sleeve shirt is perfect for wearing to either the club or for a stage performer entertaining. When it comes to mens fashion shirts that are meant to be worn no tuck style button down shirts, Prestige makes the styles like this metallic gold long sleeve shirt that won't get ignored.